The Losa nuraghe is one of Sardinia's best preserved megalithic monuments. 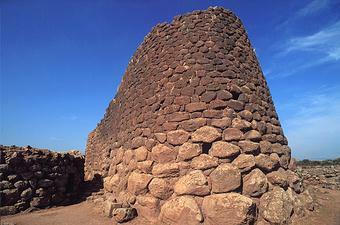 The nuraghe is a kind of stone defensive tower with a truncated cone shape, built in what is known as Cyclopean style, which consisted in piling up huge blocks without using mortar or other binding material. The ancient inhabitants of Sardinia usually erected these buildings (about 6500 on the island) in dominant positions or by rivers. Archaeologists largely agree that the nuraghi had the same function as later medieval castles. The Losa nuraghe, dating from the middle Bronze Age, is built with enormous basalt boulders and comprises a central tower, 13m (43ft) high and 12.5m (41ft) wide, which originally had three floors. Around it there are other later towers, enclosed in an imposing triangular curtain, surrounded and fortified by defensive walls with towers and arrow-slits (up to the 7th century BC). Nearby are the ruins of nuragic and Punic-Roman villages.